I always find myself craving tacos, but in trying to be healthy, I don't want to indulge in greasy ground beef!! 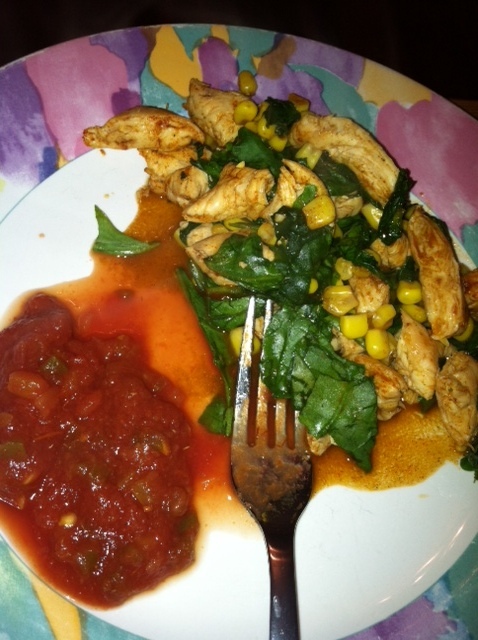 My Mexican chicken is a great alternative and is super easy! Coat a small pan with cooking spray and begin cooking the chicken on medium heat, turning after about 5 minutes so each side is light brown. Chop the chicken into bite size pieces (you can do this before or after you cook it). After the chicken is thoroughly cooked, add 1 tablespoon of taco seasoning into the pan with a tablespoon or two of water (you don't want the taco seasoning to be chunky, water helps it to thin it and glaze over the chicken). 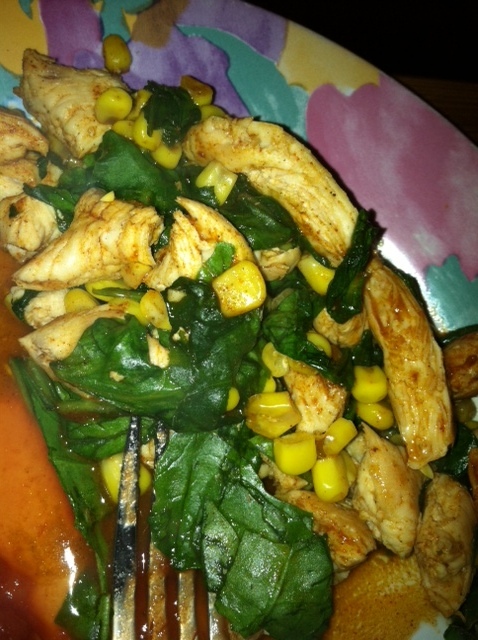 Add in the corn and spinach, allowing it to heat up. I also enjoy adding chopped onion, bell peppers, and black beans! If necessary, add another sprinkle of taco seasoning to the mixture. And with that, you're done! Enjoy it with a side of salsa and you have yourself a delicious and quick entree. This is a great meal for anyone with a busy life, on a low budget, or a collee student... I think a majority of us could fit into that category so give this meal a try!! If you're really craving taco shells, try the "whole grain" taco shells- 2 shells only have 110 calories! Heat then up in the microwave or toaster oven.